Once upon a time, when our ancestors wanted to eat cake to celebrate a family birthday, they took themselves to the local grocer who was happy to sell them some milk, flour and eggs. From there, it was DIY and, hey presto, a cake! Until one day the grocer told our ancestors’ descendants that he knew a baker who baked a very fine birthday cake: it even had chocolate flavouring. Why go to the trouble of gathering ingredients, mixing them together and fretting nervously, lest the cake fail to be perfectly puffed, when someone else could make it for you? Which all worked nicely until someone thought the pre-baked chocolate cake could be improved by adding superheroes and cartoon characters and someone else decided that they could pop an entire birthday package in the post, complete with balloons and novelty bags. But even that could be bettered. They could send it all round in a van, to be delivered by a clown who would not only hand over the aforementioned goodies, but would spend the afternoon creating a memorable birthday experience! Well, it’s not quite Economics 101, but hopefully you see the point. 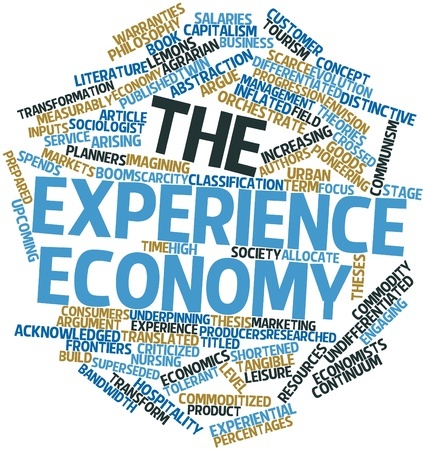 We’ve gone from an economy based on providing a commodity, to an economy that provides goods, then a service, and eventually an experience. For the record, it’s Cafe Smart in East Belfast but I suspect they’re not the only coffee joint that likes to offer an experience and not just a cup of coffee. Which, you probably don’t need me to tell you, has been turned into an art form in recent years. I had coffee in a friend’s house a couple of years ago: watching him prepare the brew was like being transported back to chemistry class. Nor are the purveyors of coffee alone in providing an experience for their customers. Ever been in an Apple Store? But what does it have to do with church? I have a sneaking suspicion – and I would really like to hear what you think – that this might be one of those areas where as things go with the culture, so they go with the church. I wonder if the church has moved into the business of attempting to provide an experience and if many of those who attend church judge their attendance on the basis of what kind of experience they had. I need to express one or two caveats here. For one thing, Christianity is meant to be experienced. I am aware of the debates regarding the extent to which Acts is meant to be normative, but it’s hard to read that particular NT book and conclude that Christianity is a purely intellectual exercise. If the fruit of the Spirit is joy, is that not something to be experienced? Frankly, I think a lot of us could do with a more experiential expression of church at times: more of a clear sense of the presence of God. Is he not meant to be among us when we gather to worship? For another – and to be clear – this is not a post about not serving coffee in church! Preferably not instant coffee, though: in that case, mine’s a black tea! And if you want to add donuts or muffins, go for it. In fact, why not have the occasional Sunday where you have a meal together?! In fact, do what you can to make sure that the folk who attend your church feel welcomed and valued. And sing songs that are memorable. And preach in a way that is interesting. There is nothing necessarily wrong the idea of church as a positive experience. I doubt that the person who leaves a church service feeling bored is necessarily more spiritual than the people who leave with a smile on their face. Is it possible for leaders – and worship leaders – to become susceptible to a shift where they start to act as though the key to church growth and prosperity lies in how well they create and market an experience? And it is possible for church attenders to start to judge the value of a gathering based on how it felt to be there and if there is a bigger buzz on offer at the church round the corner, they’ll go there? And on the other hand, to what extent should churches take account of the cultural climate in order to be relevant?